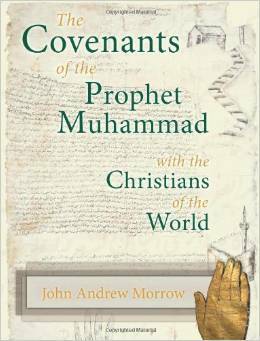 A couple of years ago I wrote a blog post, Mohammed’s apocryphal Covenants, about John Andrew Morrow’s book The Covenants of the Prophet Muhammad with the Christians of the World, finding several reasons to doubt the covenants’ authenticity. Concentrating on the most famous and best documented one, the Covenant with the Monks of Mt Sinai, I found two startling anomalies arising from the timeline. According to Dr Morrow the Covenant with the Monks of Mount Sinai was written in 623 AD but Sinai did not come under Muslim control until c.640 AD, several years after Mohammed’s death. Anomaly #1 Why would Mohammed grant a covenant of protection in 623 AD to a group who were not under his control and he was therefore not in a position to protect? Anomaly #2 Why would he release them from the obligation to pay the Jizya tax which they were therefore not subject to? But there is an even more glaring anomaly, one which I only just realised was staring me in the face. According to Dr Morrow’s own translation, the Covenant with the Monks of Mt Sinai was written “on the third of Muharram in the second year of the Prophet’s Hegira”. Since Muharram is the first month of the Islamic calendar, that means it was written just one year after the Hijra, Mohammed’s migration to Medina. By that time Mohammed had not yet fallen out with the other religious and tribal groups in Medina. In fact the only substantive thing he is reported to have done in his first year was to set up the Constitution of Medina which gave equal rights and responsibilities to Muslims and non-Muslims. Jizya, the discriminatory poll tax imposed on subjugated non-Muslims, only came later, during Mohammed’s wars with the neighbouring People of the Book and polytheists (the first reference to it in the Koran comes in verse 9:29, revealed c.630 AD). Not only that but on p.94 of Dr Morrow’s book he specifically states, in another context “…the jizyah did not exist in the early days of Islam”. Anomaly #3 The Jizya tax which the Covenant exempted the monks from paying did not yet exist, even in Medina. To sum up, Mohammed’s Covenant with the Monks of Mt Sinai, supposedly written in 623 AD, promised protection to a group that Mohammed was in no position to protect, and exemption from paying a tax which they were not subject to, and which did not even yet exist. I would say all that means that the Covenant could not possibly have been written in 623 AD and must therefore be a later forgery (presumably perpetrated by Christian monks hoping for relief from their Muslim overlords). If anyone can provide another explanation for these 3 anomalies, not involving time travel or precognition, I would be grateful to hear it. Dr Morrow certainly does not address any of them in his book. In the meantime I maintain that the claim of authenticity for the Covenant with the Monks of Mt Sinai is just plain nonsense. Why does it matter? Because along with the book goes a Covenants Initiative, the aim of which is to spread the acceptance and influence of the Covenants in hopes of improving relations between Muslims and Christians. A laudable aim no doubt, but if its main foundation is a forgery then the Initiative amounts to no more than wishful thinking leading to an unrealistic assessment of the man who confronts us today just as he has for 1400 years. I encourage readers to compare the picture we get of Mohammed from the Covenants, religiously tolerant and accepting, with the one we get from the Sira, a ruthless warlord by anyone’s standards. Unfortunately it is the Mohammed of the Sira, who is firmly embedded in Islamic tradition. If the promoters of the Covenants Initiative can refute my objections then I will apologise and wish them well but, going by past experience, they won’t even try. The nearest thing I have been able to elicit has been some fairly inventive abuse from Dr Morrow. Perhaps you might have better luck. This entry was posted in Uncategorized and tagged achtiname, ashtiname, constitution of medina, covenant with the monks of Mt Sinai, Covenants Initiative, jizya, John Andrew Morrow on July 28, 2017 by ECAW's blog. This is pure balderdash written by a nobody…………..Why? and we lowly simpletons must shield our eyes and bow to you in homage……. NOT!!!!! Thank you for your insightful appraisal. You are quite right, I am a man of true and stunningly light sabre like brilliance, but I was a little hurt to be called a Yank. I am of course impressed that Napoleon, more of a general than a scholar of ancient texts though, was so taken by the document but I cannot see how he could have signed it next to the prophet’s signature. For one thing no original document exists, only much later copies of copies, and for another all that exists, even on the copies, is the outline of a hand. Now, about those anomalies. All the relevant information is available in Dr Morrow’s translation and in readily available histories of Islam. It should be a simple matter disproving my claims. I look forward to seeing your refutation. First things first, I must say I find it a curious experience being referred to as “hiding” behind an acronym by someone calling himself Masihi Theophilus. But since you brought it up…. I do indeed hide behind my pseudonym but the reasons for it have nothing at all to do with the Covenants or Dr Morrow; rather with a section of his co-religionists who regard criticism of Islam as blasphemy…and you know what that means, as the cartoonists at Charlie Hebdo found out. It is usually necessary for those who criticise Islam to either surround themselves with expensive security (like Geert Wilders) or to disappear (like poor Molly Norris) or to adopt a pseudonym (like Ibn Warraq). Although I am probably too obscure to attract the attention of the throat slitters among us, I see no reason to take the risk and choose the third option as the least troublesome. Not only that, but my own government now enforces sharia compliant limitations on free speech, and police constables who once patrolled the streets now patrol social media for signs of Islamophobia. Anyone reckless enough to point out unpleasant truths about Islam on Facebook can expect a visit from the boys in blue, and that’s just for starters. Serious offenders can find themselves in prison, thrown among devout Muslims for a beating like Tommy Robinson, or mysteriously dying half way through their sentence like Kevin Crehan. Secondly, it would have been helpful if you had given a link to my post so your readers could see your chosen excerpts in context for themselves, wouldn’t it? Thirdly, congratulations on attempting to refute my claims. It is something that neither Dr Morrow nor any of his principal supporters will do. I have asked them. Professor Shoemaker’s book looks interesting but you make so little use of it. As to the three volume work on the Covenants, no doubt a bargain at £156, including contributions by Dr Morrow, perhaps you can see the problem in attempting to answer scepticism about an author’s scholarship with more quotes from the same author. Or perhaps you can’t, but I regret to say that I cannot put any credence on this new testimony from Dr Morrow. Yes, Ibn Ishaq reports that Mohammed received a delegation of Christians in Mecca but that has no bearing on the matter in hand as far as I can see. All the rest of the above comes from a book I have not read, and by an author, Zafar Bangash, who I have reason to mistrust (as explained above) so I am sorry to say I am unwilling to accept any of the above at face value. But what is that face value even? Did these communications contain anything like the contents of the Covenant? I suspect if they did we would have heard about it by now. I can find no trace of the Epitome of Nektarios of Sinai apart from this reference by Dr Morrow. But even so, I am sure you will see the problem in using a document making extraordinary claims, written only a few hundred years ago, purportedly based on ancient Arabic texts and found in the Monastery of St Catherine, to validate another. I notice that Nektarios writes “IN the second year of Muhammad’s hijrah his religious and military power increased” whereas you write “BY the second year of the Hijrah…” Since we are talking about something that supposedly happened at the start of the second year of the Hijra, it makes all the difference in the circumstances doesn’t it? I can only see this as sleight of hand on your part. This is just an assertion which is not supported by the evidence you bring forward. The fact of the matter is that the Prophet Muhammad offered to make alliances with non-Muslims throughout the Middle East and beyond. If they pledged loyalty to the Prophet, as opposed to the Byzantines and Persians, he promised to offer them freedom of religion and freedom from onerous taxation. Only those who violently opposed the Prophet were subject to conquest and tribute. Call it the carrot or the stick. The Christians of Najran, the Sinai, Assyria, Armenia, and Persia actively sought the protection of the Prophet Muhammad from their oppressive overlords. The same can be said of the Jews and Samaritans from Palestine, the Jews from Yemen, and the Jews of Maqna. The same also applied to the Zoroastrians. As Nektarios of Sinai noted, polytheists, Magians, Jews, and Greek Christians submitted to the Prophet Muhammad during the early years of his rule in Medina. The above are again mere assertions, in this case with no supporting references at all apart from the mysterious Nektarios of Sinai. If this is correct, the spread of Islam into the Sinai and Palestine did not take place during the reign of the first two Caliphs: the Prophet Muhammad had himself consolidated Islam in all of Arabia, and several surrounding regions, during his own lifetime. What if it isn’t correct? You bring forward nothing to support the claim, presumably because you have not read the book, and even Prof Shoemaker, in the second paragraph, claims only that “these reports of Muhammad’s leadership during the Palestinian invasion likely preserve an early Islamic tradition”. Even if it is correct what bearing does it have on the question in hand? The Covenant itself tells us when it was supposedly written, in 623 AD. What Mohammed did or didn’t do in 634 or 635 AD is irrelevant. I take no issue with the above history of pre-Islamic jizya but it has no bearing on the issue at hand, which is at what point in time did Mohammed impose it on subject People of the Book. When Morrow wrote that “the jizyah did not exist in the early days of Islam” (2013: 94), he was apparently referring to the Meccan period and the initial Medinan period. The Prophet, for example, did not impose jizyah on the non-Muslim citizens of the Ummah in Medina. The Jews of Medina, with whom the Prophet concluded the Constitution of Medina, were not subject to the jizyah. The same cannot be said of the Jewish Opposition, namely, the three tribes that lived on the outskirts of Medina and who were apparently not parties to the Constitution of Medina. Mohammed imposed the jizya on non-subject tribes? How did he manage that? This is news to me, and I suspect to others reading this. So the outlying tribes were both paying the jizya and not paying the jizya in the early days of Medina. Think you’d better revisit this section! The jizyah did not apply to citizens of the Ummah who were subject to the Constitution of Medina nor did it apply to covenanted communities of priests, monks, and rabbis. It did, however, apply to allied non-Muslims as well as belligerent populations that were subjected by force. We all know that “belligerent populations that were subjected by force” were subject to the jizya (of which there were none a year after the Hijra) but allied non-Muslims? What justification do you have for claiming that? However, even they could be excused from the jizyah in return for military service. Simply because verse 29 of chapter 9 of the Qur’an, which commands Muslims to fight unbelievers until they pay the jizyah, was reportedly revealed in the year 630 CE, namely, year 9 of the hijrah, does not mean that this form of taxation did not previously exist. In fact, it is mentioned in prophetic traditions that date from the seventh, fourth, and second year of the hijrah. Please supply details of these prophetic traditions. Remember my claim is that Mohammed had not instituted it by the time the Covenant to the monks of St Catherine’s was written a year after the Hijra, a claim made by Dr Morrow and which I only quoted. Well, that was very thin gruel indeed, a mixture of irrelevancies, unsupported assertions, assertions which might or might not be supported by books other than those which we both have access to, and more assertions by Dr Morrow. What you certainly have not done is to explain the anomalies I referred to, but merely attempted to “explain them away” with scatter shot quotes then claim victory. In my view only someone who had already given up critical enquiry in favour of belief could accept that you have come anywhere close to refuting my claims, just as only a true believer could claim that Dr Morrow made a convincing case for the Covenant’s authenticity. Prophet. 3 vols. Newcastle upon Tyne: Cambridge Scholars Publishing, 2017.